Depression refers to a set of mood disorders that affect a large number of people worldwide. According to the U.S. Centers for Disease Control and Prevention (CDC), 7.6 percent of Americans over the age of 12 suffered from some sort of depression between 2009 and 2012. The use of essential oils is one of the many natural remedies for depression. But what are the best essential oils for depression? How do you use these mood-boosting oils? 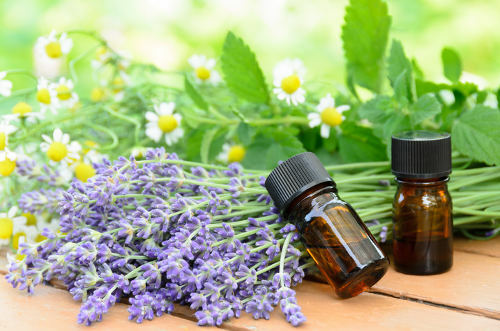 In this article, you will find information on which essential oils may help with depression, how to use these oils, and the precautions that you should take when using essential oils for depression. Lavender oil has many uses including helping out with migraines and insomnia, but it also may help with anxiety and depression. Lavender is a flowering plant that’s actually part of the mint family. It has long been used in perfumes. Lavender oil can be used for general anxiety and depression but may also be helpful with other specific depressions. Complementary Therapies in Clinical Practice published a study in 2012, which showed that diffusing lavender oil might help women at risk for postpartum depression and may also help with PTSD. Ylang ylang is the name for the flower that blooms from the Cananga tree. It originates from Indonesia but spread to Malaysia in the nineteenth century. Ylang ylang may work due to it being a mild sedative, thus causing the body to relax and be less stressed. Beyond treating depression, ylang ylang oil is also used to treat high blood pressure and as an aphrodisiac. It’s also used in many perfumes. Extracted from the bergamot orange, bergamot has long been used in perfumes as well as dry nasal products like snuff and snus. This essential oil is used to treat depression and anxiety. Roman Chamomile has a smooth, relaxing scent that is used for anxiety and depression. This oil is extracted from the Chamaemelum nobile plant which is also used to make cosmetics, perfumes and herbal teas. Wild ginger is a more recent essential oil find for depression. In 2014 study of stressed mice, the animals showed less depression-like behaviors when exposed to the vapors of wild ginger oil. There are a number of other essential oils for anxiety and depression, but these five are some of the most effective and easiest to purchase. It should also be noted that there are some combinations of oils that may also work. Now that you know what oils may work for you and your depression, the next step is to use them. But one of the things to keep in mind is that every oil can be different in its usage. Some oils are inhaled, while others are massaged into the skin—it can be a little confusing. But that’s all right, as we’ve got your guide on what to do with these five essential oils. Essential oils can be daunting when you first buy one. You may wonder how you use it. Should I put it in an infuser or dab some on my neck? What makes it trickier is that one oil may have to be used differently than another to achieve the desired effect. To that end, we’ve put together an easy guide on how to use lavender, ylang ylang, bergamot, roman chamomile and wild ginger oils to help with depression and anxiety. Lavender oil can be used in a few different ways to help relieve depression and anxiety. The first is to use a diffuser and place that diffuser on your nightstand, by your head near your bed, that way you inhale the scent while you sleep. Another way is to put a few drops behind your ears or a few drops in the bath with you. Ylang ylang is best used by diffusing it or massaging it into your skin, especially in areas where you can also smell the ylang ylang oil’s scent. A great method for gaining the benefits of bergamot oil is to place a few drops into your hands and rub them together. Then cup your hands and breathe in deeply. Bergamot oil may also be massaged into your feet or stomach in order to gain the required effect. This essential oil can be rubbed into your feet just before bed or used by adding a drop or two to a hot beverage like tea or hot water. Wild ginger oil is mainly used topically; you can rub it into your abdomen in order to help dissipate some of the symptoms associated with depression and anxiety. It can also be inhaled for a similar effect. As with anything of this nature, tread very carefully when using essential oils as a depression natural remedy. While some of these essential oils have been used as natural mood-boosting oils for decades (some for centuries), it’s important to remember that the scientific evidence to back up these claims is very limited. If you are suffering from severe depression, it’s best to consult your doctor. Depression can be a very dangerous and scary thing; don’t take it lightly. Due to their natural origins, you should also be on the lookout for allergic reactions—especially if you are using the oil on your skin. Essential oils won’t cure your depression; treating the condition with the advice of a medical doctor is a better bet if your depression is very involve a doctor that are a better bet for that if your depression is very serious. But if you just get a little blue every once and a while or you’d like something in addition to medication you might be prescribed. All of the essential oils above are pleasant smelling and might just help you with some of the symptoms of depression. Brody, D., Pratt, L., “Depression in the U.S. Household Population, 2009-2012,” National Center for Health Statistics, December 2014; https://www.cdc.gov/nchs/data/databriefs/db172.htm, last accessed March 1, 2017. McDermott, A., “Can Essential Oils Treat My Symptoms of Depression?,” Healthline, July 14, 2016; http://www.healthline.com/health/depression/essential-oils-for-depression#Overview1, last accessed March 1, 2017. “Roman Chamomile Essential Oil: Uses, Benefits, and Precautions,” Sustainable Baby Steps; http://www.sustainablebabysteps.com/roman-chamomile-essential-oil.html, last accessed March 1, 2017. “Ginger Essential Oils: Uses, Benefits, and Precautions,” Sustainable Baby Steps; http://www.sustainablebabysteps.com/health-benefits-of-ginger.html, last accessed March 1, 2017.